Successfully Added SuperSpeed 7-Port USB 3.0 Hub to your Shopping Cart. A simple and effective device for you to connect your various computer peripherals to your PC or laptop, quickly and easily. SuperSpeed USB 3.0 is 10 times faster than the traditional High-Speed USB 2.0, which means you get lightning fast data transfer by using this little device. This translates into faster response of your keyboard, mouse, or storage devices. No complicated wiring, no driver installation. 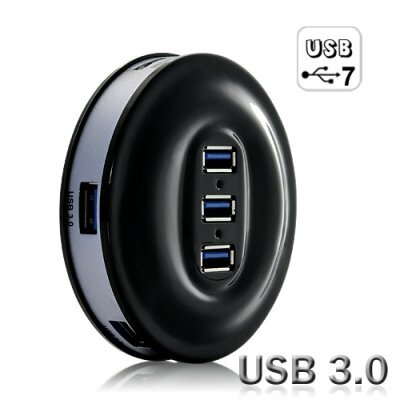 Just connect your mouse, keyboard, or any other computer accessories to the USB hub and you are ready to go. It couldn’t be easier. Just Google to see how much similar products are selling for online. Even a hub with mixed USB 2.0 and 3.0 will sell far more than ours. Even if you don't intend on buying one for yourself, stock your online store with these futuristic devices to lock in some amazing profits! Brought to you by the leader in direct from China wholesale electronics - Chinavasion. No software or drivers necessary. Power the hub either directly from a computer or from a wall socket to recharge your devices as digital cameras, MP4 players, or phones. Why USB 3.0 is faster? As a new technological breakthrough, the SuperSpeed USB 3.0 has an additional physical bus that is added in parallel with the existing USB 2.0 bus. This means that where USB 2.0 previously had 4 wires (power, ground, and a pair for differential data), USB 3.0 adds 4 more for two pairs of differential signals (receive and transmit) for a combined total of 8 connections in the connectors and cabling. Furthermore, USB 3.0 utilizes a bi-directional data interface rather than USB 2.0's half-duplex arrangement, where data can only flow in one direction at a time.